The Mahoning Avenue Viaduct carries Mahoning Avenue over the Shenango River and railroads in New Castle, Pennsylvania. Built in 1923-24, it replaced the circa 1890 Gardner Avenue Bridge that had been destroyed in a flood in 1913. The Gardner Avenue Bridge over the Shenango River was constructed in 1890 7 to connect New Castle to the seventh (Mahoningtown) and eighth wards. 3 7 The crossing, a three-span Pratt through truss, had a total length of 380 feet and deck width of 20 feet. 7 It included a six-foot sidewalk on each side and a single track of the Mahoning & Shenango Street Railway Company. During the early 1900’s, the seventh ward rapidly grew from a population of 5,000 to near 10,000. 3 It was also the site of intense industrial development due to ample flat land along the Shanango River. As early as November 1901, the city called upon the construction of a modern bridge over the Shenango River and railroads from Mahoningtown to Moravia Street. 7 It was endorsed in April 1902 by the court. In 1905, 5 the thought of replacing the Gardner Avenue Viaduct with a more direct, high-level route was brought up. 3 The existing Gardner Avenue alignment included the crossing of nine railroad tracks which were frequently closed by passing trains. Additionally, the Mahoning & Shenango wanted another route to Mahoningtown as its Mill Street line was congested with hundreds of commuters who were coming from the fifth ward to Mahoningtown to work. An alignment via Atlantic Avenue in the sixth ward. It eliminated “The Narrows,” a dangerous railroad crossing near the Black Bridge that was a constant source of worry for the Pennsylvania Railroad. It would access Oakland, an outlying suburb, and Mahoningtown. This alignment was preferred by the streetcar company. The other alignment is via Smithfield Street, which advocates claimed would be cheaper. Ultimately, the new alignment selected centered on Mahoning Avenue which would connect to South Moravia Street at Terrace Avenue on the east side of the river. 5 The Pennsylvania Railroad, Buffalo, Rochester & Pittsburgh Railroad, Baltimore & Ohio Railroad and Erie Railroad all agreed to finance the construction of the viaduct over their tracks while the county agreed to build the main spans over the river and approaches. The proposal was tabled for lack of interest 5 and its proposed cost of $600,000 7 until early March 1908 when the Gardner Avenue bridge was declared unsafe for travel and closed to traffic. 4 The Mahoning & Shenango who pressed to have the crossing repaired and put back into service. On March 23, 1913, intense rain storms inundated western Pennsylvania and many other states. 2 Those storms, preceded by other intense weather events in the previous weeks, continued for several days. By March 25, Neshannock Creek and Shenango River were cresting their banks, causing much of the industry in the city to stop production. Bridges along the waterways struggled to remain intact under the immense flow of water. 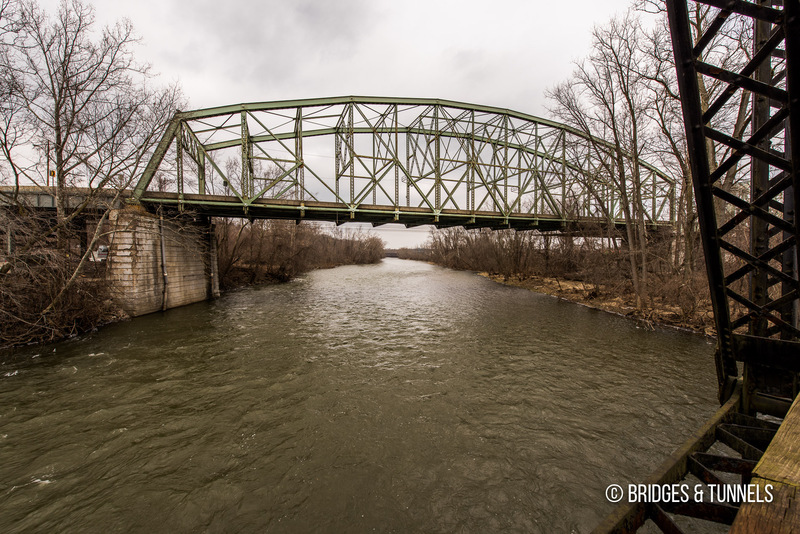 In the early hours of March 26, the Black Bridge broke free from its abutments and floated downriver intact, smashing into a water intake house of the Carnegie Steel Company before crashing into the Franklin Railroad Bridge. 2 The Franklin Railroad Bridge, weighed down with eight railroad cars filled with coal, collapsed at 3 pm. The remnants of the Black and Franklin bridges then floated down to the Gardner Avenue bridge. The viaduct collapsed at 6 pm. Eventually, the collapsed bridges came to rest against the Buffalo, Rochester & Pittsburgh Railroad Bridge. The Mahoning Avenue Viaduct proposal was revived in 1911 when the county asked for plans and specifications for a much shorter bridge. 7 But because of the flood in 1913, the Commonwealth of Pennsylvania obligated itself to reconstruct highway bridges that were destroyed by flood waters on navigable streams. On December 12, 1919, representatives of the Pittsburgh & Lake Erie Railroad argued that the eastern terminus of the new viaduct be located at Jefferson Street at the south bank of Big Run, crossing over Moravia, several railroad tracks and the Shenango River. 6 The railroad claimed the changes would add $200,000 to the cost of the viaduct. Funding was finally secured in March 1923 and construction began shortly after. 8 Designed by John Farris and Thomas A. Gilkey, the new 1,195-foot bridge was constructed by the Independent Bridge Company of Pittsburgh with three Pennsylvania through trusses of 307-feet, 306-feet and 207-feet and eight deck plate girder approach spans. The new Mahoning Avenue Viaduct was dedicated on December 18, 1924. Work began in late 1958 8 to remove most of the bridge deck and to replace girders that had warped. 9 The crossing thad not been adequately maintained and it was rusting due to a lack of paint. It was customary at the time to paint bridges every five years but the Viaduct had only been painted twice, with the last paint applied in 1944. It was not until fall 1960 that the disputes in funding were resolved. 8 Conn Welding finished the repairs and the bridge reopened on October 7, 1961. The crossing underwent renovation again in April 1986, reopening on August 30. A major rehabilitation project by the Pennsylvania Department of Transportation began on the Mahoning Avenue Viaduct in May 16, 2016. 12 The two-year project includes the repainting of the bridge, the replacement of bearings, and substructure and steel repairs, the installation of a LED lighting system and new pedestrian railings. “Road and Bridge Views.” New Castle Herald, 12 Mar. 1902, p. 1. “Old Black Bridge – New Castle PA.” Lawrence County Memoirs, article. “What Leading Citizens Think of Proposed Two Routes to Mahoningtown.” New Castle Herald, 21 Mar. 1907, p. 7. “Can Repair Bridge.” New Castle Herald, 12 Mar. 1908, p. 1. “Talk of Viaduct is Again Revived.” New Castle Herald, 27 Mar. 1908, p. 3. “Wants Big Viaduct Changed.” New Castle Herald, 12 Dec. 1919, p. 1. “Mahoning Avenue Viaduct.” The Bureau of Engineering of the Public Service Commission of the Commonwealth of Pennsylvania, Harrisburg, WM Stanley Ray, 1915, pp. 68-71. “Mahoning Avenue Viaduct – Maoningtown (New Castle) PA.” Lawrence County Memoirs, article. Daniels, Don. “Mahoning Viaduct, Tribute to Red Tape.” New Castle News, 27 May 1959, p. 1. “PUC Hearing On Viaduct Is Continued.” New Castle News, 23 May 1958, pp. 1-2. “City Hall Sidelights.” New Castle News, 18 Mar. 1960, p. 18. Wachter, Debbie. 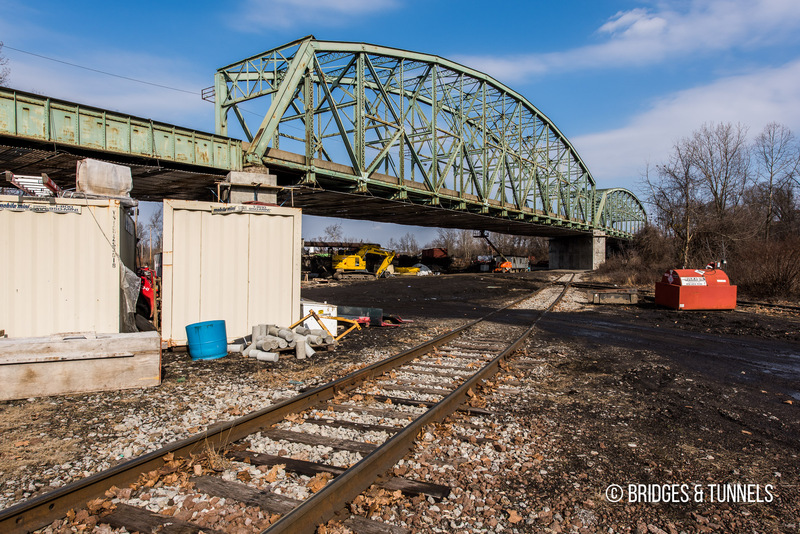 “Viaduct heads PennDOT list of local road, bridge projects.” New Castle News, 10 Mar. 2016.